As one storm system delivers heavy snow to coastal Maine this morning, another is brewing off the West Coast. 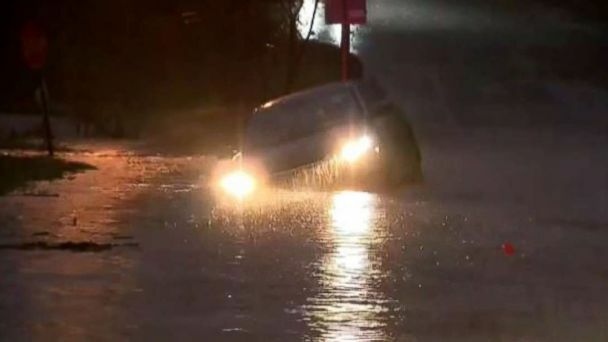 In the East, 3 to 5 inches of rain fell in several regions, prompting water rescues, as more snow in northern New England and Maine is expected throughout today -- up to 8 inches today in some parts. Snowfall in Maine is expected to end by this evening as an arctic air mass settles into the Northeast, producing very cold wind chills on Tuesday morning. A series of storms is heading for the western U.S. and then likely will make their way east throughout the week. Wind, snow and flood alerts have been issued from Washington to California in anticipation of the coming weather systems. Snow, rain, waves and wind all are possible up and down and near the coastline. A stronger storm is expected in the Pacific Northwest and Northern California on Tuesday, with more precipitation and strong winds. This storm will head east over the next few days, and by late Wednesday or early Thursday should be delivering rain to the South and East, where already-saturated areas will be vulnerable to potential flooding.